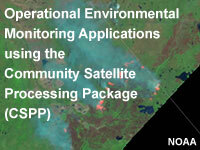 This resource demonstrates the variety of satellite imagery and products accessible through the Community Satellite Processing Package (CSPP). Two videos, the first focused on imagery applications and the second on microwave applications, provide an overview of the types of weather and environmental information available through CSPP. Using CSPP, forecasters and others needing timely access to data can download and display imagery and products from Joint Polar Satellite System (JPSS) instruments. The resource provides some background information for obtaining and using the CSPP software, which is distributed by the Cooperative Institute for Meteorological Satellite Studies at the University of Wisconsin.